This is surely among the most difficult and disturbing books I’ve ever written, but I felt I had to write it because no one else would or could. I say “disturbing” because it is the grim story of how humans are killing and eating endangered great apes for food in Central Africa. The cliché about Africa is that everyone is desperate and their desperation explains and excuses everything. But the story is not about hunger; it’s about choice. Chimpanzee and gorilla meat is sold at a prices higher than beef or pork in the big cities of Central Africa because it’s a luxury item. In doing my research for this book, I traveled into Central Africa, met and interviewed ape hunters in the forest, explored the big city meat markets, experimentally purchased gorilla and chimp meat, and visited a couple of restaurants serving “bush meat” (wild animal meat of all sorts). Having tried python and porcupine and who knows what else (but not primates), I am now a contented vegetarian. 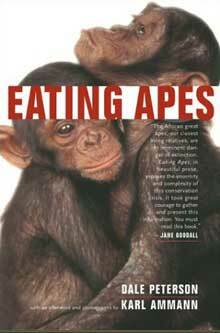 If you’re interested in the story of bush meat, this is, I am convinced, the best single introduction to the subject. Eating Apes was named the Best Book of the Year by The Economist and Toronto’s Globe and Mail, and a Top Science Book of the Year by Discover magazine. It’s been translated into German and Japanese. FreeFromHarm.org's Exclusive Interview with Author Dale Peterson.